Celebrating Your Day Your Way! Have your meadow wedding at Allegra Farm. 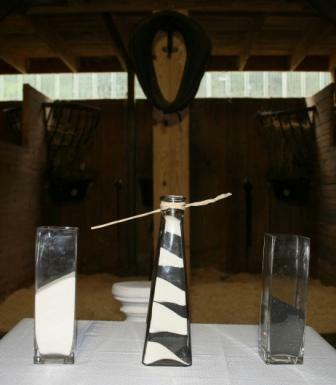 Or even a barn wedding! 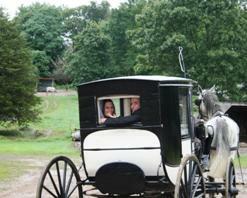 If you're having your wedding elsewhere, John Allegra will bring the horses and carriage to you. Jennifer and Benjamin were married at Allegra Farm on the rainiest day of the summer. "Jen & Ben" had originally planned to have their meadow wedding by the pond, but Tropical Storm Danny said otherwise. 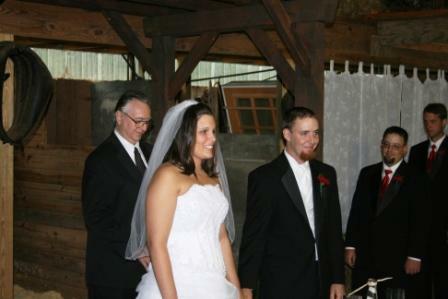 The photograph shows Jennifer being escorted from her coach by her father for a barn wedding instead. John Allegra, shown here in his role as coach driver, owns Allegra Farm. John is a very nice person, and a pleasure to work with. John has many kinds of horse-drawn vehicles, from open-topped carriages to glass-windowed coaches to sleighs. Can you imagine arriving at your winter wedding in a horse-drawn sleigh? My apologies to John Allegra for not knowing the proper names for his vehicles ("carriages", "coaches", and "sleighs" is all I remember). Lola, the Best Dog, lived up to her title. She treated all equally, saying "Hi!" with a wag of her tail. Well-behaved dogs and other non-humans are always welcome when I perform a ceremony! 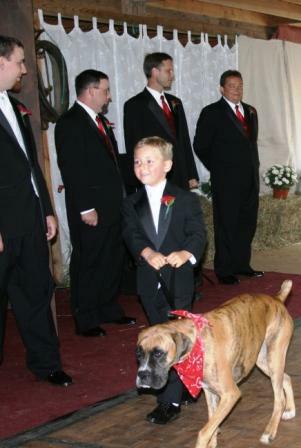 Pets are people, too, and belong at their pet parents' weddings. While Jennifer and Benjamin poured their sand in their Sand Ceremony, Karen and Kelly, two of Benjamin's sisters, sang "From This Moment". If the weather had been better and Jennifer and Benjamin had a meadow wedding by the pond, we could have had a Celtic Pebble Toss, another kind of unity ceremony. Jennifer and Benjamin were smiling happily as they got into their coach. Jennifer couldn't resist a final wave to all of us. Many thanks to the anonymous gentleman guest who took these photographs. Please tell me your name so that you get the proper credit. Your help was much appreciated! To get married at Allegra Farm you will have to get your marriage license at the East Haddam Town Hall. Allegra Farm is close to Colchester, Connecticut but it is legally in East Haddam. Allegra Farm is highly recommended, whether you want a carriage for your wedding, a hayride, or a sleigh for your special event! Please visit the Allegra Farm Site (WWW.AllegraFarm.Com) to see photographs and ask John Allegra for a full-color brochure. Allegra Farm should not be confused with Cafe Allegre, a very good restaurant in Madison, Connecticut that is related to The Inn At Lafayette (also in Madison) and The WoodWinds in Branford, Connecticut. Having enjoyed dinner at Cafe Allegre and married people at WoodWinds, I assure you that they are outstanding! The Web Site for Cafe Allegre is WWW.AllegreCafe.Com. For The Inn At Lafayette please visit WWW.InnAtLafayette.Com. Go to WWW.TheWoodWinds.Com to see photos of a great wedding venue.